Sitting here in Kangerlussuaq west Greenland expecting not a large melt year. Like another late melt season, 2013, a sticky atmospheric circulation pattern in the past 5 months has favored cold air transport down the west coast of the island. …above average albedo everywhere except the south southeast where precipitation is below average. …caused in not a small degree by persistent atmospheric circulation anomalies, the hallmark of inter-annual variability. All this has me expect it would take quite the opposite pattern for 2015 melt to hit the high melt in 2014 (in fits and spurts, with warmest June on record here in ‘Kanger’, west Greenland), extreme melt in 2012, 2010, high melt in 2011, 2009, 2008, 2007. The past warm episodes were due to persistent atmospheric circulation, a.k.a., stick weather patterns, favoring heating of west Greenland. What we have in 2015 and in 2013 the sticky cold pattern opposite. There is evidence, two most recent of a growing list of citations, of Arctic warming slowing the jet stream, causing it to meander more, creating sticky weather patterns. Welcome to the new abnormal. D. Coumou, J. Lehmann and J. Beckmann. The weakening summer circulation in the Northern Hemisphere mid-latitudes. Science, 2015. doi: 10.1126/science.1261768. An Australian news piece juxtaposes mysterious Siberian holes with my Arctic tundra carbon release concerns but I have no idea about the cause of the holes. As a physical geographer, I’m aware of pingos that these features resemble but these features are holes and pingos are mounds. If you ask me, talk to field scientists with expertise in permafrost. For further reporting on the mysterious holes, see here. As in the mid-July case, the early August ice sheet albedo has declined to an average more than 5% (or 2 standard deviations) below the average of the previous 12 years (2000-2011). A “2-sigma” event has a probability of occurrence under 5% in a random climate. The decline is again concentrated in the accumulation area above 1500 m elevation where melting is less common as it is in the lower elevations. …all in a self-reinforcing feedback loop that amplifies melting (see Box et al. 2012, link below). The early August decline is similar to August declines in 2008, 2004, and 2001. What is different is that the decline is from a lower point. The 4 August 2012 albedo is not as low as the lowpoint reached on 15 July, 2012. 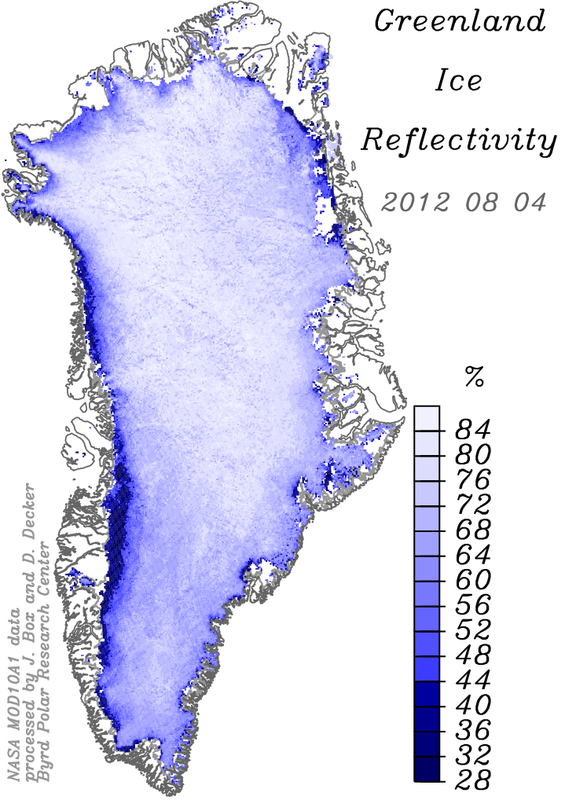 In the latest update of daily Greenland reflectivity (a.k.a., albedo) observed by the NASA MODIS sensors, we see the effect of fresh snow brightening the ice sheet surface after the extreme low albedo in mid July, 2012. Late July’s reflectivity remains below other years in the observational record since 2000 and the values are trending lower again because of the darkening effect of near-surface air temperatures reported for 24-31 July being near or above the melting point, according to ground observations maintained by Konrad Steffen, director of the Swiss Federal Institute for Forest, Snow and Landscape Research. 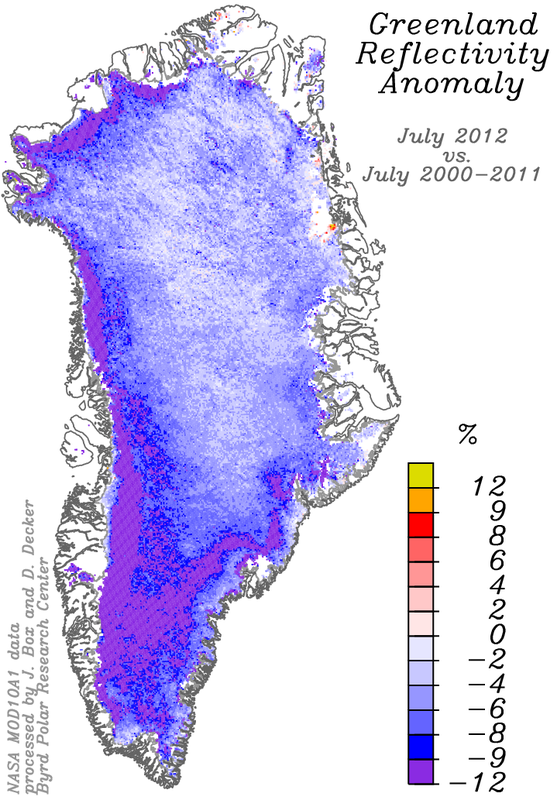 The earlier high melt area episode was 11-15 July, 2012. Daily ice sheet averaged reflectivity values for 13 individual years beginning in 2000. 0-3200 m refers to the elevation range of the whole ice sheet. If the 24-31 July high temperatures are on par with those from 11-15 July, 2012 and if there is not another summer snowfall at the higher elevations of the ice sheet, I’d expect the albedos to decline further, reaching say 65.5% in the coming days. These results are after the externally-reviewed publication Box et al. (2012), citation below. Reflectivity (a.k.a. albedo) anomaly computed as the July average albedo for 5 km grid cells for the 12 year period (2000-2011) minus July 2012 values. Negative anomaly values mean the ice sheet is darker than average. Greenland ice sheet albedo in the elevation range from 2000-2500 m. This is the accumulation area where some melting is observed. Much more melting occurs at lower elevations. With the most recent update to our near-real time monitoring of ice sheet albedo, we observe that the ice sheet albedo continues dropping into unprecedented low values especially at the higher elevations where there is little melting. Are the widespread wildfires, for example in Siberia or in Colorado adding to the albedo reduction? Or given that “Since 2000, global coal consumption has grown faster than any other fuel. ” … “Around 6 Gt of hard coal were used worldwide last year and 1 billion tonnes of brown coal. ” source: http://www.worldcoal.org/coal/uses-of-coal/ Is coal combustion part of the problem? Specialists in snow impurities and albedo are on this problem. But, what are their results? Since August 2010, The Canadian Ice Service (CIS) has been tracking the largest several fragments of the 4x Manhattan Is. (290 sq. km, 112 sq mi) largest observed single iceberg calving from Greenland. The fragments pose a significant shipping and oil platform hazard. 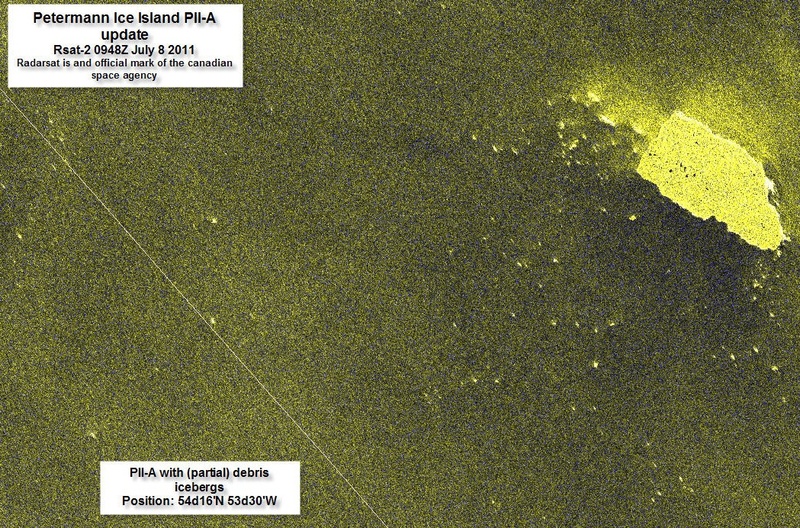 Some other fragments are grounded along Canadian Arctic islands. A 2/3 Manhattan sized (~50 sq km, ~20 sq mi) fragment is now ~150 km (~100 mi) off the Labrador coast at a latitude below 54 degrees. This rectangular fragment, has side lengths of ~8 km x ~6 km (5 mi x 4 mi) and a thickness of ~30 m (~100 ft). Thus, the volume is ~1.5 cubic km (0.36 cubic miles), or 1.5 trillion liters (400 billion gallons). The glacier this ice island comes from discharges annually ~1.2 cubic km (Rignot and others, 2001). The year 2010 ice detachment represented several years of ice discharge from this glacier. According to Johannessen, Babiker, and Miles, “there have been at least four massive (100+ km2) calving events over the past 50 years: (1) 1959–1961 (~153 km2), (2) 1991 (~168 km2), (3) 2001 (~71 km2) and (4) 2010 (~270 km2)”. The available evidence suggests a retreat to a new minimum extent. Johannessen and others 2011 Fig. 3. 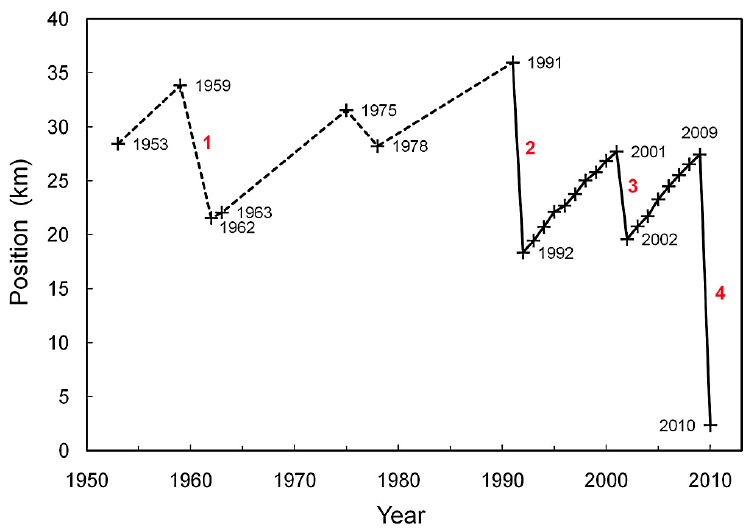 "Petermann Glacier calving-front positions (+ symbol) observed between 1953 and 2010, cf. Fig. 2b–d. Positions are indicated relative to an arbitrary reference point along the longitudinal axis of the floating ice tongue. Solid line: Interannual variability of the calving-front position, 1991–2010, derived from satellite images, Dashed line: Variability of the calving front position, 1953–1991, derived from sporadic satellite and aerial observations. Red numbers denote the four largest changes in the record: (1) 1959–1961, (2) August–September 1991, (3) September 2001 and (4) August 2010." Box and Ski (2007) write “Theoretical calculations by Weertman (1973), Van der Veen (1998) and Alley and others (2005) lead to the conclusion that a water-filled crevasse has unlimited capacity, acting under gravity, to force water to the bottom surface of a glacier.” This process of hydrofracture is confirmed for the Antarctic Larsen B ice shelf disintegration which was preceded by widespread surface water ponding on the ice shelf surface. When surface air temperatures are above the melting point and are, further, above normal, more extensive hydrofracture is elementary. Satellite remote sensing indicates a reduced season of solid sea ice extent and concentration in front of glaciers around Greenland. As such there is less capping of the water from atmospheric interaction from winds. 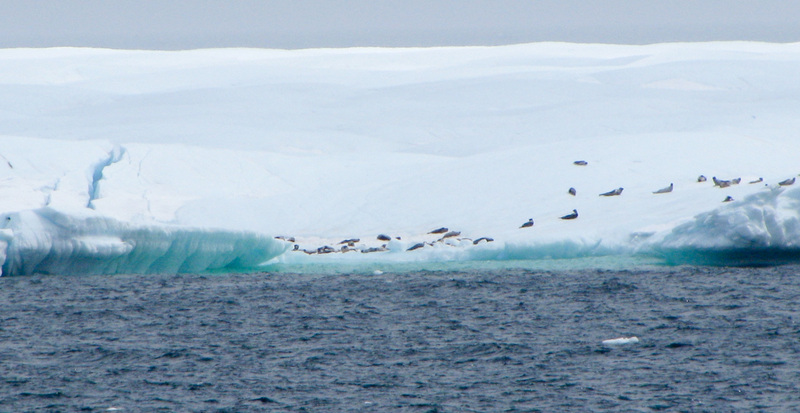 Wind action on the water surface promotes water circulation that can promote increased heat exchange between the ice shelf and the ocean waters. Especially if relatively warm water is forced to circulate more than it otherwise would, against the sub-marine ice, enhanced melting would be expected. Further, the sea ice may provide mechanical stability (buttressing or glueing) to the glacier front, rift areas, and fractured areas pieces. So, melting can enhance the unglueing effects, promoting fracture propagation. Yet, other processes such as high tides and strong wind events could also have contributed, and even been the straw that broke the glacier’s back. So, it’s not always obvious to make the link with climate warming even as nearly 100% of glaciers are in a state of retreat. Alley, R.B., T.K. Dupont, B.R. Parizek and S. Anandakrishnan. 2005. Access of surface meltwater to beds of subfreezing glaciers: preliminary insights. Ann. Glaciol., 40, 8–14. Box, J.E. and K. Ski, Remote sounding of Greenland supraglacial melt lakes: implications to sub-glacial hydraulics, 2007: Journal of Glaciology, 181, 257 – 265, 2007. Johannessen, O.M., M. Babiker, and M.W. Miles (2011) Petermann Glacier, North Greenland: massive calving in 2010 and the past half century, The Cryosphere Discuss., 5, 169–181, 2011, www.the-cryosphere-discuss.net/5/169/2011/ doi:10.5194/tcd-5-169-2011. Rignot, E., S.P. Gogineni, I. Joughin, W. Krabil, (2001) Contribution to the glaciology of northern Greenland from satellite radar interferometry, Journal of Geophysical Research, vol. 106, no. D24, Pages 34,007-34,019. Van der Veen, C.J. 1998. Fracture mechanics approach to penetration of surface crevasses on glaciers. Cold Reg. Sci. Technol., 27(1), 31–47. Weertman, J. 1973. Can a water-filled crevasse reach the bottom surface of a glacier? IASH Publ. 95 (Symposium at Cambridge 1969 – Hydrology of Glaciers), 139–145. I below post, for the public record, my anonymous review of a new paper published in Journal of Geophysical Research. I rank the paper: “Good” because the paper’s methods seem solid. Yet, depth with regard to examining causal factors is missing. Further, the paper’s main point, as it seems, that recent warming is not without precedent, may already be obsolete because 2010 was such an extreme melt year AND that more warming in Greenland is likely simply for Greenland to be in sync with the northern hemisphere. The paper thus, in the very least, requires a revision that includes consideration of 2010 data. Yet, consideration of causal factors of cooling and warming and treatment of the Box et al. (2009) prediction, which for 2008-2010 has been accurate, would give the paper the depth consistent with JGR’s standard. As is, the only depth of the paper is the statistical modeling, that is, the regressions to reconstruct melt area and comparison of the recent warming versus past warm episodes. There is theory to explain warming and cooling episodes in Greenland. Yet, the paper does include this important dimension. Therefore, to increase the depth or impact of the work, the paper should elaborate causal factors that explain the ups and downs in the reconstruction. One thing different about the recent warming versus the 1920s warming is that Greenland climate continues to lag the northern hemisphere pattern… The work should therefore reflect on the prediction made in Box et al. (2009) that: simply to be in sync with the northern hemisphere pattern, Greenland climate must warm (after year 2007) by 1.0 – 1.5 C. In the years after 2007, that is, 2008-2010, this prediction has held true. And that still more warming should happen in Greenland in the coming few years is more likely than not. A major volcanic eruption, of course, see relevant literature, would cool Greenland’s climate for 1-3 years. The pre-1840 results should be abandoned because is cannot or at least it has not been demonstrated that there sufficient sampling to compare with the subsequent complete series. Title: A less ambiguous time frame should be included in the title than: “A Reconstruction of Annual Greenland Ice Melt Extent Going Back to 1784” is needed…Something like: “A Reconstruction of Annual Greenland Ice Melt Extent 1784-2009”. Why? If the paper is published, some years down the line, the title would become ambiguous. line 52: the following statement seems not accurate: “Such a comprehensive, annually resolved reconstruction has not previously been undertaken, and will better place current observations of melt extent in a longer-term historical perspective.” Box et al. (2009) modelle an annually resolved temperature reconstruction for the Greenland ice sheet. line 103 define “closely match” quantitatively. line 124 define “quite similar” quantitatively. line 140: Does this relationship account for sub-monthly melt frequency? “Our Greenland melt reconstruction therefore focuses on the relationship between monthly average temperatures” I suspect a reduced sensitivity to melt intensity for 2 reasons: 1.) summer variability is minimal; 2.) a summer average of e.g. 0 C still includes periods above melting. line 166 “winter conditions act to pre-condition summer ice melt through a snow/albedo response” certainly because of thermal erosion of heat content. “snow/albedo response” is vague and does not mention important heat content issue.